Reprinted by permission of Alfred A. Knopf, Inc., and University Press of Virginia. Cook's Notes: No, I still can't follow a recipe to the letter very well so I doubled the water to 1/3 cup to give the apples something to steam in, cut the sugar in half because I'm trying to cut out a lot of my sweet tooth, and added a tsp of cardamom to the nutmeg/sugar mixture. Ooh la la. That was a great add. Next time I'm going to try brown instead of white sugar and maybe a touch of vanilla to the butter. Glenna, I'm really a big fan of the brown sugar so I know I'd do that. This is just a great fun post! Food seems to always connect us doesn't it, right down to the TV. Wooohooo! Now that you've made it, I can't wait to make the Glenna's Version of Peggy Hill's Apple Brown Betty. :o) Three cheers for peer pressure and Google. ha! My personal favorite is "Wookiee Cookies - A Star Wars Cookbook" although only in title because I can't say I've bought and/or made anything from it. OOOH! But maybe that's a good project for me and my 11 year old nephew this weekend during his visit! Barnes & Noble here I come! I'll have to remember also to print this Apple Brown Betty Recipe, we do a Fall Corn Maze (cornmaze.com)/Apple Orchard Trip each fall and I'll need something to do with all of those delicious apples we pick! I really wish I could hit print and all of the recipes in your blog would spit out of my printer into a cookbook! I had to go back and look at your Frito Pie recipe - Frito Pie totally reminds me of growing up. It was a baseball game staple, and a family favorite when we were camping!! Betty looks wonderful. If you haven't tried it, the Splenda Brown Sugar BLEND is a must-try. You use half as much as the recipe calls for because it's half Splenda. I can't tell the difference. It's got me eating Oatmeal again. I love Peggy. I can hear her voice as she talks about her Brown Betty--and Frito Pie! It looks beauitful, but you better be careful, Peggy gets very upset if she suspects other people bake a better BB than her! So that's what Brown Betty is. I confess, I never did know before. Sounds tasty, and I do like the idea of the lemon zest in here a lot. Tanna--I agree. I'll do that next time! Kathe--That's very sweet. Thank you so much. Deborah--Yes, it's one of those memory things. I only make it MAYBE once a year but I sure enjoy it when I do. DM--I agree about recipes. That's part of the joke. I can't follow a recipe to save my life because I always play around with the ingredients or directions. But this one time I wanted to follow the directions exactly. I almost made it. Patricia--Me too and this did taste pretty fresh and didn't seem overwhelmed by the bread. 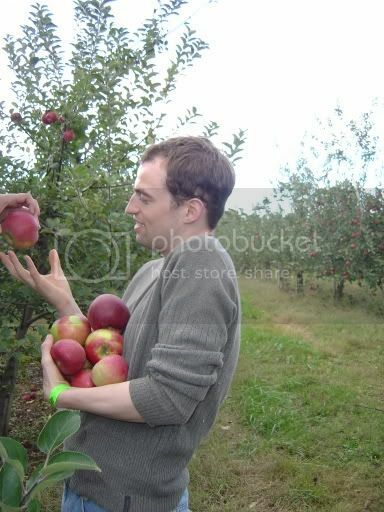 There were more apples. Peabody--Oh noooooo! LOL! I love King of the Hill. It's like watching my neighborhood. Kalyn--I know! Me neither. It was fun just for the novelty. Thanks for the sweet apple treat, Glenna! I'm with Kalyn on this one--I had never even heard of a Brown Betty. 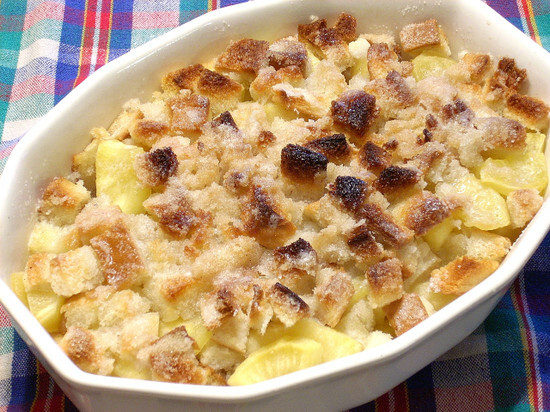 My mother-in-law makes a similar dish, but she calls it apple bread pudding. Whatever it's called, it's delicious! How can you not love apples and nutmeg? I know what you mean about The Soprano's too. I actually posted on pineapple ricotta pie around Easter time and referenced Carmela's ricotta pie. That episode was a hoot, wasn't it? Susan--Yes! Loved that episode. Really showed how touch Carmela can be. I'd never heard of the Brown Betty either until KofH but it was pretty good. Glenna, first time visitor (thanks to WHB) and I've heard of brown betty(s) for years and now I'm ready to make it now that apples are coming in season. Also this is a "guy-friendly" dessert, hard to screw up! Peter--LOL! I like that! It is a guy-friendly dessert. My husband, Gene loved it. Hmm...all this sugary stuff revs up my appetite!!! apples are a great fruit and ideal for desserts! but I'd ask people not to recommend use of Splenda though, at least without some research. Pls visit this article for some more info. On the show, Peggy mentions that her recipe adds orange juice. peggie hill uses a cup of orange juice not water. Peggy didn't use nutmeg, that was Minh's improvement/addition to spite her. Here's an old fashioned Brown Betty recipe dating back to 1916. Peggy Hill uses margarine, not butter. In fact in the Thanksgiving special where they are stranded in the airport she makes a point of it. You're right but I have to eat it :-) and we don't eat transfast because of my husbands heart disease. Hey, thanks to everyone who commented! It was a fun recipe to try! Yum! Your version sounds wonderful!!! Peggy Hill's Apple Brown Betty didn't include nutmeg! It was their neighbour Minh who tried to copy the recipe and added nutmeg to make it taste better!